Nowadays, many businesses that have used eCommerce solutions know the well-documented benefits. Among a wide range of software options, you can find many reasons to consider PrestaShop as desired platform. The shopping cart carries reputation of popular solution with 200,458 current users all over the world. Since nothing is ideal, the platform obtains some disadvantages. With so many aspects to compare, let’s outline the primary capabilities of other shopping carts, and define the best PrestaShop alternative to reach company prosperity. 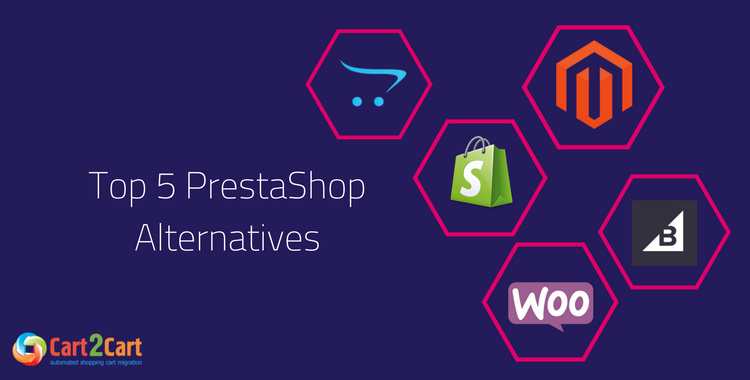 Why to Look for PrestaShop Alternative? open source solution provides you with an opportunity to own website at no cost. You are not required the license fee to establish online shop. It is a great choice for merchants searching to start up a new online store with limited budget. easy-to-use platform obtains the simple design and convenient back-end interface. You can handle the e-store smoothly with minimal technical know-how. The user-friendly interface enables you with the effortless management and maintenance of the shop. customization options help you add or delete the features of solution to fit your business requirements. You can take advantage of the modules and themes from PrestaShop’s Marketplace to create unique presence of your website. demographic assistance is represented by the multiple languages and currencies that make localization process simple. The online shops using Prestashop are used across Canada, UK, USA, Germany, Japan, and more. Although the support is available for only English and French, the e-shop can be translated to around 40-45 languages. looking for the scalable platform. Since Prestashop is designed to fit small to medium-sized stores, shopping cart is not a great idea when your business is looking to expand. The free platform can be an asset to enhance online business exposure with multi-vendor support but with limited advantages to help large or complex projects. in need of the more robust capabilities. The free version includes a basic set of features that is not enough for enterprises. You will need to purchase additional modules or extensions to meet the advanced company demands and spend a pretty sum of money. seeking for the official support team. Prestashop obtains only active user community with over 700,000 members who are always ready to help, yet there is no official support assistance that can become an inconvenience for some users. If you prefer a fully-fledged store with advanced features for a large-scale project, you can analyze eCommerce market and investigate Prestashop alternatives. Let’s go through a list of the platform's counterparts, learn their functionality and discover the process of PrestaShop export. Shopify App Store is full of the extensive variety of free or paid plugins and apps that you can simply add to your shopping cart. Enhance business performance and boost platform’s functionality by choosing required add-ons among over 1,500 options. Keep in mind that Shopify integrates with Amazon and eBay, so you are able to add them as a Sales Channels in your e-shop. 100+ feature-reach Shopify themes help you build impressive and professional online shop that suits your business identity. Use the customizable, bug-free and responsive themes for company branding, product database and images on site. Categorize them according to your design or product your e-store is selling. dedicated support team is available 24/7 via email, live chat, and phone. The platform takes the upper hand in Shopify vs PrestaShop comparison. Take advantage of Shopify Help Center that offers you to find the answers to commonly asked questions, user guides, and tutorials. Take part in the community discussion forums and interact with other users. Learn useful insights on how to sell online with Ecommerce University offering the ebooks, webinars, video series, etc. 400+ official extensions created by the professional developers enables you to build the impressive and multi-functional website. Get the official template - Storefront or choose from completing WordPress themes that WooCommerce is compatible with and improve your business processes. SEO capabilities of the solution considerably prevail over PrestaShop and recognized as one of the best solutions to enhace SEO practices. Benefit from the WordPress’s blogging features and fast speed. Integrate with the various third-party applications like Jetpack, Yoast SEO or others to optimize the website in the more timesaving and efficient way. WooCommerce support policy provides you with information where you can find the answers to your queries. Benefit from assistance via email for any product purchased on WooCommerce.com or use the WordPress.org forums for the free. Explore the how-to documentation and video tutorials to learn more about the solution. cost index is an inevitable part while choosing the desired shopping cart. Alike Prestashop, WooCommerce and WordPress are open-source and don’t cost a penny. Build your online shop for free, yet save a buck for the domain, hosting, paid themes and applications to broaden your website functions. Magento Marketplace offers the world's largest selection of extensions. Explore the apps for all sort of categories starting from marketing, customer support, payment, accounting, analytics, sales, shipping, or site optimization, and more. Regarding the themes, choose among 12 themes available. Find more templates by visiting ThemeForest, and create your own Magento theme in case you have the required technical knowledge. splendid web design is represented by the tons of CSS customization choices ready to use for web design. Follow Magento team hints on the latest web trends on responsive web design. Magento Support is represented by the 24/7 client assistance together with the various tutorials, release information, security updates, etc. Create and maintain the efficient online store with the help of the development documentation. Register at Magento Forums to take part in the discussions with other Magento enthusiasts. OpenCart Marketplace is rich in the huge variety of modules and themes to expand your business features. Investigate the comprehensive themes to cover any sector like payment providers, shipping methods, analytics, language packs, and so on. Download the templates from OpenCart Extension Store and get the themes with a possibility to customize them. Get a chance to edit code to fit e-store requirements since the solution is open-source. payment modes get the stronger position than PrestaShop including cash on demand payments, live shipping quotes, money orders, discount management, multicurrency, and pricing per customer group. Take advantage of the 36 inbuilt payment methods: Klarna, PayPal, etc. customer support for your project takes the lead over PrestaShop since the solution offers phone, email, knowledge base, blogs, videos, online self-serve, and request form. Participate in OpenCart Community Forum to learn more about the shopping cart. OpenCart is free of charge like PrestaShop. Remember about the extra spendings on the domain name, SSL certificate, web hosting fee, paid add-ons, and others. professionally-looking themes have the attractive design choices that can be easily customized using HTML and CSS editors. Get free and premium ecommerce templates to make designing a gorgeous, fully responsive store swiftly. selection of apps and integrations provides you with an opportunity to build the robust online shop. Analyze BigCommerce Marketplace and explore everything you need: tools for marketing, inventory management, shipping, accounting and much more. world-class support is introduced by 24/7 assistance via phone, email, and chat. Find answers with troubleshooting articles, and educate yourself with the video series and in-depth guides on how to grow your business. Stay informed with the latest updates by visiting the BigCommerce Community page. When you are planning to set up the online shop or move data to the more advanced platform, the task is to perform a deeper dig into the eCommerce market and find the most suitable shopping cart. So, take the above-mentioned information into consideration and choose the PrestaShop alternative that fits your organization objectives and needs. Get a chance to run the PrestaShop migration to the desired shopping cart with Cart2Cart automated migration service. Test the SaaS in action and run a free Demo Migration right now!